Now that the Black Lightning TV series has come out, it is interesting to notice the differences between this series and the TV show. The TV show has a much more smaller cast of characters, whilst this series has a huge cast of characters. I would have thought that the series would have been a lot similar. 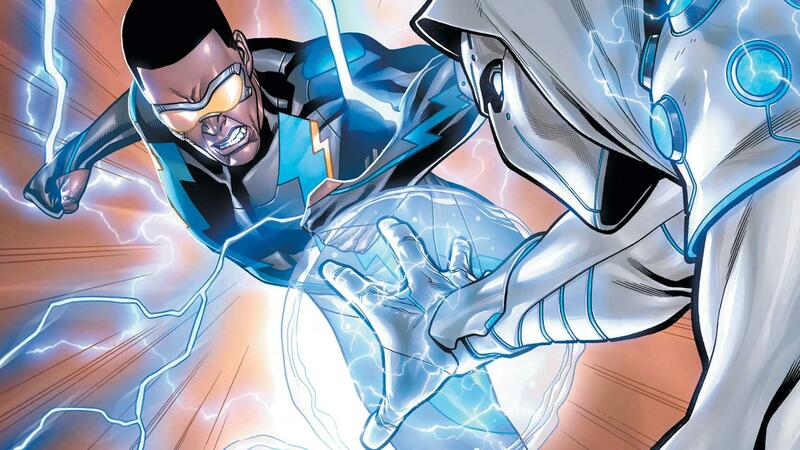 This issue is basically the issue that focuses on the fight between Black Lightning and the criminals. Fight scenes in comic books don’t tend to be that interesting, but instead showcase really great art. This fight was slightly different in that not only did it showcase great art, but it did feel a lot more like it mattered. Black Lightning and the cops had a really shaky relationship from the start and it was worsened because they thought that he killed criminals, so the fight meant so much more as he was defending not only the children that were in danger, but the cops as well. He worked with them to defeat White Thunder and the other criminals.